I had the pleasure of spending a Saturday morning talking to a truly interesting man- Mark Bego, a best-selling celebrity autobiographer. Mark Bego started writing in high school and college and had the opportunity to go to New York to meet and write about some of the biggest stars of the day like Barry Manilow, Steely Dan, Elton John and Three Dog Night. Mark has written about Elton John, Madonna, Michael Jackson, Mary Wilson of The Supremes, Martha Reeves of Martha & The Vandellas, just to name a few, and what I took away from our conversion was the love Mark has for music. Mark grew up listening to his parents’ record collection and now has made a career of his first love. The first thing he does in the morning is turn on the stereo; he spends his day studying music, trends, and who is going to be the next big thing - It's a talent that Mark has had all his life. In the early 80s, a large publisher asked Mark who he thought would be the next big thing in music. "Madonna and Michael Jackson," had been Mark's reply. He turned out to be right! Mark was the first writer to champion and write books about Michael Jackson and Madonna. Mark even traveled with Michael and his brothers on the 'Victory' tour and wrote the book “On The Road With Michael!” Mark admitted that sometimes not all the stars he has written about are still successful, and some have died young, like Michael Jackson. Mark said it was strange to see people he's written about starting to pass away. We talked about the difference between Elton John and Whitney Houston (Mark has written about both). Both have had issues with drugs and both are currently drug free, Mark and I noticed how much drugs can affect a career. Elton was lucky, drugs didn't affect his voice or writing ability, but Whitney has lost some of her vocal ability due to her flagrant drug abuse. Mark said he was happy to see Whitney back, but sad at the same time because her gift is somewhat gone. Throughout our conversation, Mark shared great stories about meeting his heroes. Mark told a great story about seeing a young Pat Benatar singing a reggae version of “Stairway To Heaven” in a NY club, and while writing “Dancing In The Street: Confessions Of A Motown Diva” with Martha Reeves, Mark told me about the time when Martha was living in his Tucson, AZ home. He came into the kitchen one day to find Martha cooking soul food and singing to The Beatles. How Mark got his house in Tucson was another story in-and-of-itself. 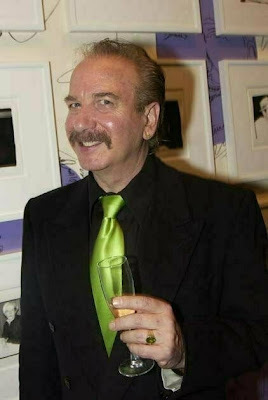 While Mark was living in New York, Jimmy Greenspoon (of Three Dog Night) stopped by Mark’s apartment and commented on how small it was. Jimmy asked what Mark was paying for it. Mark told him the rent, and Jimmy said, “You could get a house in Tucson for that price.” Soon after that, Jimmy helped Mark find a great house in Tucson. The rest is history. Mark has had a great year; five of his books have been released this year, including one about Ruth Mueller, who escaped from Nazi Germany and came to America with no money, but by the 1980’s was the president of her own corporation. Mark is in no way just resting on his laurels. In addition to being a writer, he's also an actor (he's working with Angela Bowie (David Bowie’s ex wife) on the film “Bureaucratic Assassin.”) I asked Mark if he would ever retire, and he said, "No, because music and writing is my love and you can not retire from something you love." I admire this quality. How many people can say they're doing what they love? It's always great to talk to people who love music and love their career, and talking to Mark was a great experience. As an up-and-coming editor, starting out in my writing career, it was refreshing to see the opportunities available; just makes me want to work harder!! Don't Agree With Our Top Picks? Vote Now!